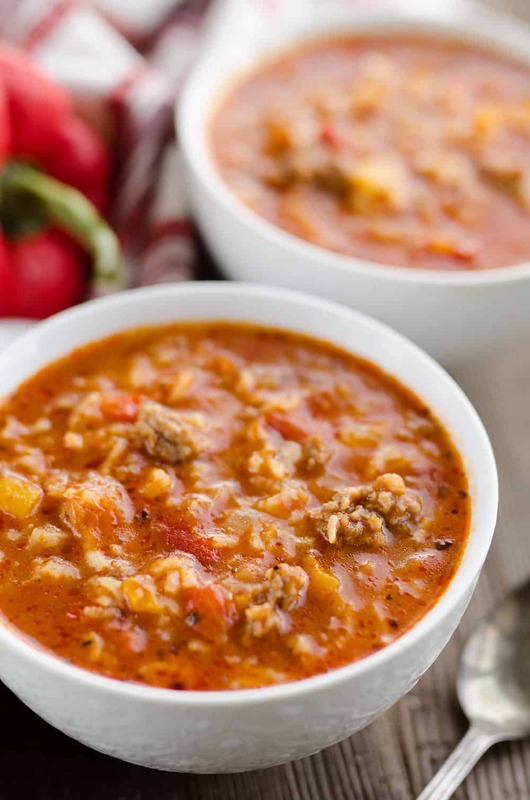 Pressure Cooker Stuffed Pepper Sausage Soup is a hearty recipe made in your Instant Pot, perfect for an easy family friendly dinner. 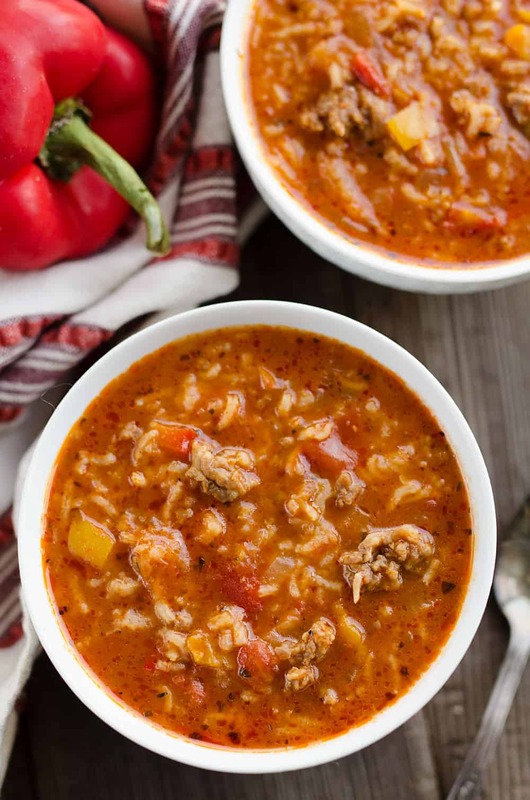 Mild Italian sausage, rice, vegetables and a light tomato and beef broth come together for a rich and delicious meal everyone will love! This Pressure Cooker Stuffed Pepper Sausage Soup is all of the best parts of stuffed peppers turned into soup form! 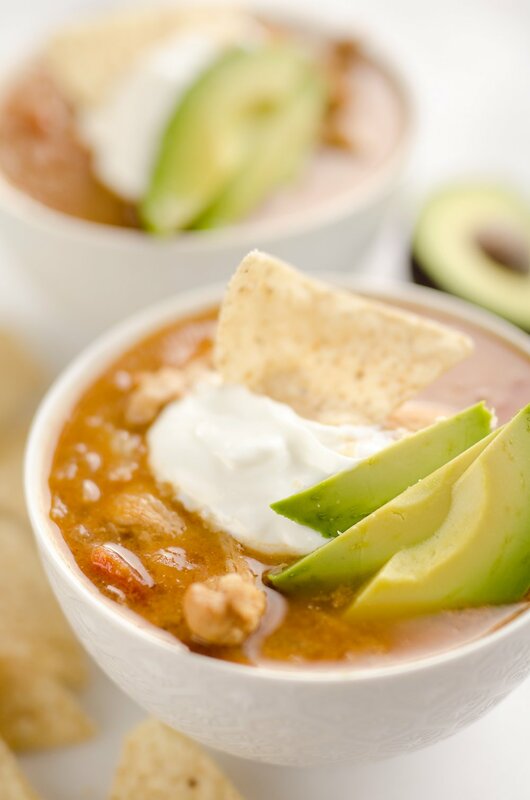 I have made this soup on multiple occasions in my Instant Pot for family and friends and it has been a hit all around. I made it over Thanksgiving weekend for my family for something a little lighter after a big turkey meal the day before. My mom turned her nose up at it and asked why I always have to make weird stuff. I insisted it wasn’t weird, as it is a tomato, sausage, rice and veggie soup essentially! 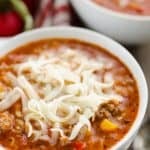 You can keep this Pressure Cooker Stuffed Pepper Sausage Soup dairy free and a little lighter by leaving off the shredded cheese on top, but that really finishes it off nicely in my opinion. 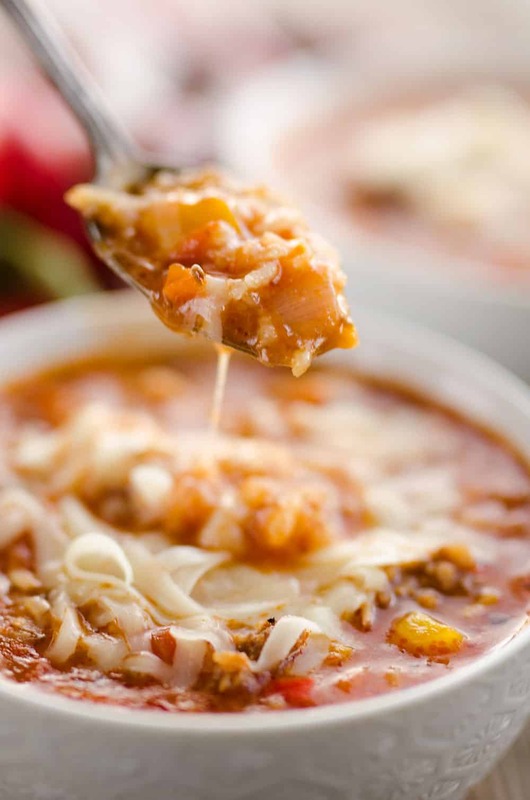 I have had it with shredded Provolone, Cheddar, Farmer’s cheese and every last one of them was a wonderful finish to the hearty soup. A loaf of crusty bread is an absolute must for me with any soup recipe, so I was sure to bake up a variety of bread to serve with it. 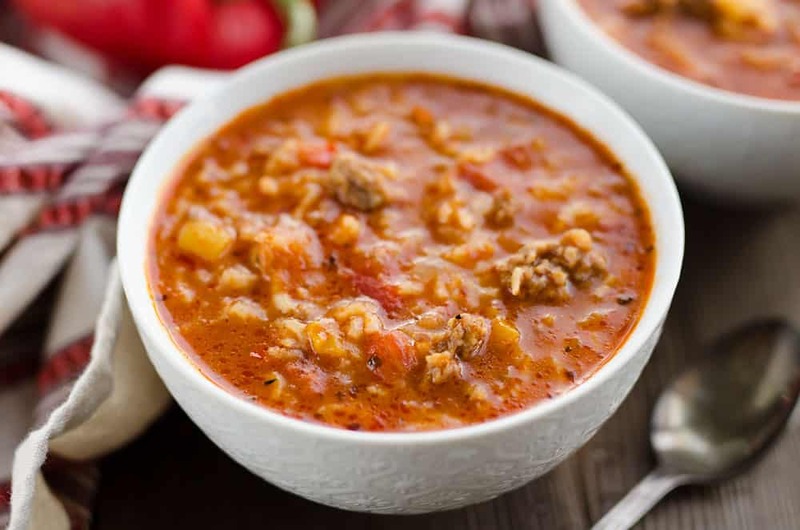 This Pressure Cooker Stuffed Pepper Sausage Soup make a very large batch, serving 10 people, so it is a great meal for a crowd. I use my 6 quart Instant Pot to make this recipe, but when I was using my mom’s 5 quart IP, it wasn’t quite big enough. I left out just enough beef broth until it reached the max line. After it was all cooked and the pressure was released, I just added in the remaining beef broth to the pot. It worked like a charm. If you aren’t serving a big family or crowd, you can freeze up this soup for another meal at a later time. The first time I made the soup for just myself and my husband, I packed up individual servings in these food storage containers for easy meals when I am on maternity leave. They are microwave safe so I can just grab one from the freezer and let it thaw in the refrigerator. When I am ready for a quick meal in between dealing with two babies, I can nuke it in the microwave. That is as far as I have gotten with meal prepping for these babies though! If you don’t want to deal with such a large batch of soup, you could certainly cut the recipe in half as well and keep the cooking time the same. 8 oz. shredded cheese Provolone, Cheddar, etc. Turn your 6 quart or larger* Instant Pot to saute. Add the sausage and cook for 3 minutes while breaking apart. Add the onion, bell peppers and garlic to the pot and saute for an additional 5 minutes. Add the remaining ingredients and give them a quick stir. Place your lid on your Instant Pot and turn the vent to pressure. Manually set your pot to high pressure for 10 minutes. When the time is up, turn the vent to steam to quick release the pressure. *If you are using a 5 quart Instant Pot, leave out a few cups of beef broth and add back when the soup is done cooking. 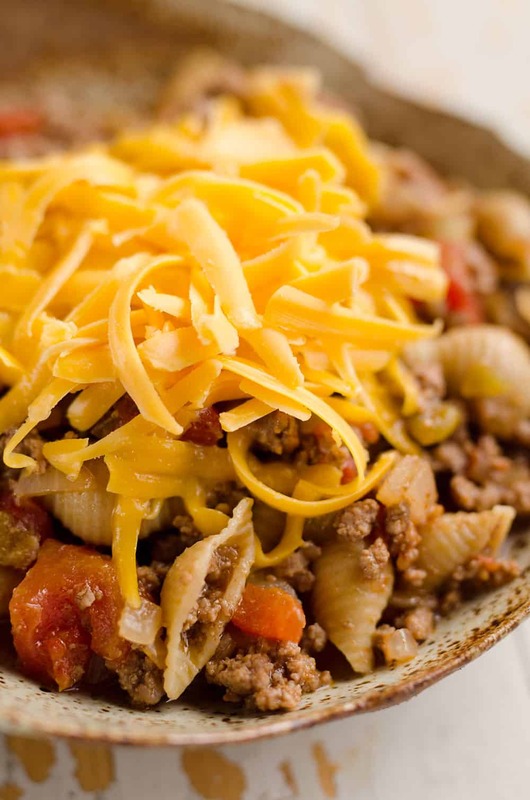 More great Pressure Cooker Recipes for your Instant Pot! It is Called open a word Processor Program, Open a Blank page and Copy and paste. It does work very well, especially if you either save or print the page right after pasting and formating it. Just so you know, I find nothing weird about this soup! It looks and sounds amazing! This looks so tasty!!! Seems like the perfect soup for the stormy weather that is predicted for today!!! Love that its an Instant Pot recipe!!! WOW this soup looks delicious! This sounds amazing! And I had hoped that as my children grew up, they would stop complaining about the food I make. But if they’re like your family, I might not hold my breath! I will come eat your “weird” food any time! Haha ya, sadly some people just never come around! Do you know how many calories are in each serving? I just updated the recipe with the nutritional information! This was great!would maybe add more meat next time? Reminded me of an old onion crock soup! Your recipe looked so good, I wanted to make it immediately. I didn’t have mild Italian sausage, so I used Honey Habanero Chicken Sausages from Sam’s Club. I didn’t have fire roasted diced tomatoes, so I used diced tomatoes. I used tomato sauce instead of marinara and coconut aminos instead of Worcestershire sauce. It was AMAZING! I’m glad you were able to make due with what you had and it turned out for you! I made this in a stovetop pressure cooker. It burned, though I knew something was off and caught it before it was inedible. The recipe was far too large for my 6 quart. To adapt it, I’d save the marinara for after pressure release (but worry that would take away from the flavor combination; melding to savory gestalt is kind of the point, no?). Maybe this would just cook up better in my dutch oven. Any suggestions on how to achieve something similar with a good ol’ 6 quart stove top pressure cooker? When using my Mom’s smaller 5 quart Instant Pot, I actually leave out a couple cups of broth. I just add that back in after it is cooked to thin it out.